My favourite herb on this planet is Basil. Sweet Italian, Thai or Holy - it's all good and I love them all. I grow it at home. That way I can have it all the time. I snip it right before I need it as I'm cooking. If tomato and basil were human, they'd be married and live happily every after with a horse and carriage, lots of babies, a fluffy dog, pink lemonade and a picket fence. 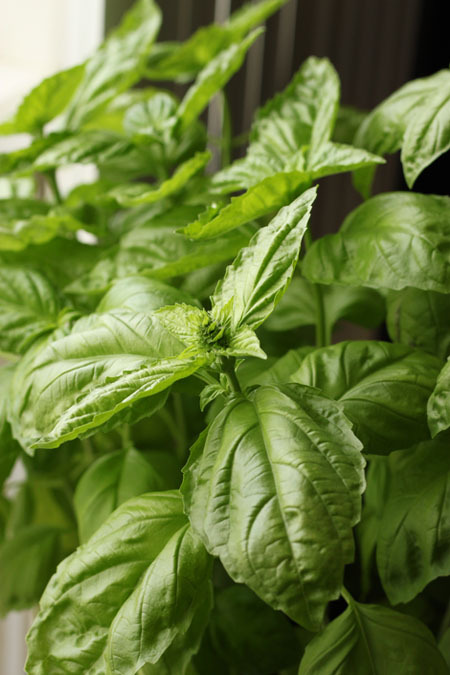 Basil also goes beautifully with pasta carbonara, fresh tomato sauce, pizza, pesto, lemon risotto, shrimp, roasted red peppers and any kind of salad including potato salads. It even goes well with strawberries. Ever had strawberry basil sorbet? Crazy! 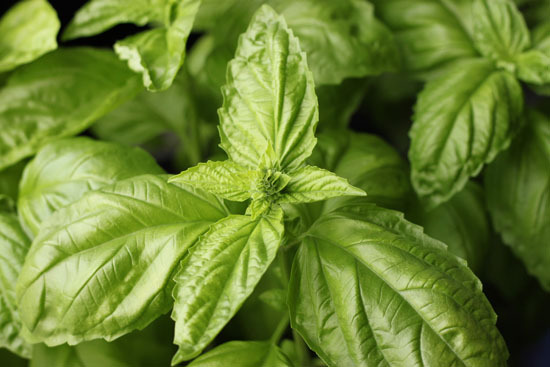 Thai basil tastes great in pretty much any Thai dish - especially green curry. Holy moly. Lots of people have been asking me how I get my basil plant so big, green and full of life. It took practice through many summers of twig like, leggy stems with a few scrawny yellowish leaves. 1. Don't be stingy with soil. Pay for good quality soil and your basil will pay you back. Look for ones that contain peat moss, black humus and/or volcanic aggregates for lightweight aeration. This is important so that your soil doesn't get packed down like mud. It also contains a special patented formula for water retention. 2. Plant in a deep pot so that the roots have room to grow downwards. 3. Water daily in the morning as early as possible. Never water at night or you could risk fungal growth in the soil. 4. Potted plants need a little help to get all of their nutrients so use Miracle-Gro once per week. 5. 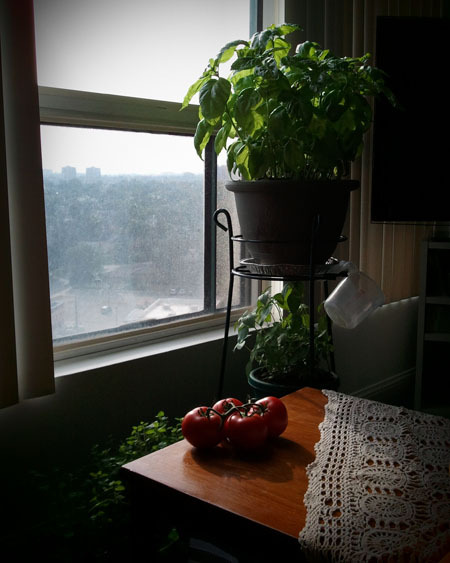 Keep your plant by the window in full sun. I keep mine facing west so that it gets full exposure to afternoon sun. 6. Harvest frequently even if you don't plan to use it. Regular harvesting encourages new and bushy growth. Begin harvesting when a plant develops three pairs of leaves. Always trim at the node just above where you see new growth between the main stem and a leaf. Trim frequently or your plant will grow up rather than out. We want a full-figured and voluptuous plant, not a leggy one. 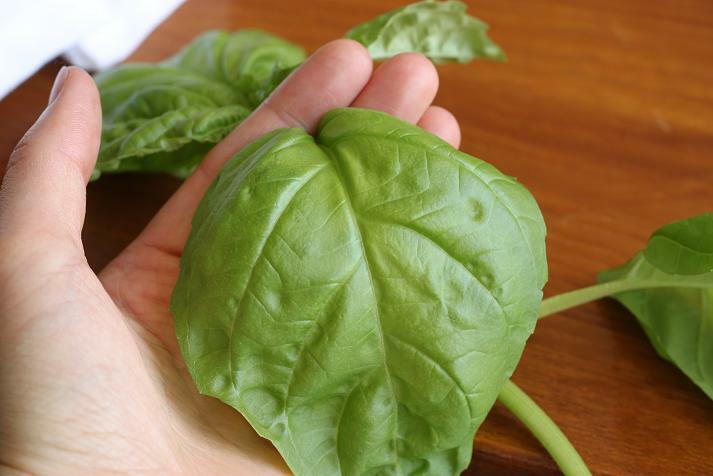 You want to trim especially if you see that your plant is going to seed - those buds mean that the basil is entering the flowering stage in preparation for seed production and so it is concentrating it's energy on making seed, not on growing. Many herbs are past their prime for eating when they reach this stage of growth as they tend to be tough, woody or bitter. If you sense that your plant needs to be trimmed but you don't necessarily need the herb right away, snip off a branch where you see new growth and keep it in a glass of water. It will stay fresh for several days. No problemo. All in all, basil needs a little love just like the rest of us. It will love you back....in your belly. Great tips! I'm having a hard time keeping up with my basil this year. It's growing like crazy! I am a newbie... Can you explain this again? I'm not sure I understand, "Always trim at the node just above where you see new growth between the main stem and a leaf." @Jennifer If you look down a stalk where two leaves are growing opposite from each other....take a closer look between the base of one of those leaves and the main stalk. You'll see a little bud and that's the new growth. Cut the main stalk right above those two leaves where the new buds are coming out. Better? Yes!! Thank you for the clarification Christina! It was definitely helpful and cleared up my confusion. ....and thanks to jennifer for asking, same question I had too! Great tips!!! My basil is growing like mad this summer! Well this is JUST the information I need. I LOVE basil and have it growing outdoors, but needed more information on how to make it flourish inside. @Rachel @ My Naturally Frugal Family Good luck! Awesome post. I love basil, and thank you for the clarification in the comments!! Fabulous advice! I love having basil in the house and have tried growing my own, but never really succeed. I am going to pick up a plant this week and give it another go with your advice. I face due West, so it looks like I'm in luck. Thanks! @FranPerfect! I'm sending good growing vibes your way! I love fresh basil. forget that stuff from the chain supermarkets. We have a basil plant on our front porch. Yours looks amazing. We may have to try indoors next. Indoor plants need a different treatment. You need to make sure the herbs will still be fresh. I also love Thai basil's I think that it gives more flavor. Thanks. Always trim at the node just above where you see new growth between the main stem and a leaf. Trim frequently or your plant will grow up rather than out. Once in a while, when you snip basil and put the cutting in a glass of water, it roots. They you get to plant it and grow another pot full of basil.